Leptin hormone plays an important role in many biological processes in animals and humans, such as appetite, immune system and reproduction. In the present study, the genetic variability in the leptin (LEP) exon 3 gene in Saudi indigenous sheep have been described. A 1041-1058 bp fragment of LEP exon 3 from 81 individuals (41 Najdi and 40 Naeimi) were amplified and sequenced. DNA analysis of LEP exon 3 revealed that three single nucleotide polymorphisms (SNPs) including two transition and one-transversion mutations were detected. The SNPs were found at positions 170, 286 and 332 of the exon 3 coding region, and resulting in three different amino acids substitutions. In addition to the three SNPs, two insertion-deletion (indel) mutations were detected in the 3´ UTR region of LEP exon 3. The identified SNPs have not been previously reported for other ovine genomes, and therefore, it may be considered exclusive for the Najdi and Naeimi sheep of Saudi Arabia. Genetic variability assessment of the Saudi Arabian indigenous sheep breeds is important to preserve genetic resources and to develop breeding programs to enhance production. As sheep meat production is the main source of income in local commercial flocks, increasing growth and feed utilization have always been an important breeding goal. Leptin hormone plays an important role in regulating body weight by maintaining the balance between appetite and energy expenditure4. Leptin, the expression product of the obese gene, is a 16-kDa non-glycosylated protein synthesized and secreted predominantly by the adipocyte tissue8. Polymorphisms in the ovine leptin (LEP) gene have been described15,7 and its association with food intake9, growth traits12,5 and carcass and meat quality traits3,2 have been reported. In turn, DNA polymorphisms in LEP gene have been proposed as predictors of relative differences among individuals for those traits13. The LEP gene is located on chromosome 4 in the ovine genome and consists of three exons and two introns. The gene structure, intron/exon boundaries and amino acid sequence are highly conserved in mammalian species10. While polymorphism in the LEP gene has been investigated in exogenous ovine genomes, there is not a single study that investigate LEP gene allelic variation in Saudi indigenous sheep population. The Najdi and Naeimi sheep are fat-tailed, adaptable to the prevailing adverse environment and considered the breeds of choice among Saudi consumers1. Therefore, the objective of this study was to characterize potential genetic variations and relationships within and between Najdi and Naeimi LEP gene by sequencing LEP exon 3. A total of 81 sheep were selected from five flocks representing Najdi (41) and Naeimi (40) breeds. Blood samples (10 mL) were collected from each sheep by jugular venipuncture into vacuum EDTA tubes. Genomic DNA was extracted using the QIAgen DNeasy blood and tissue DNA extraction kit (Hilden, Germany) following the manufacturer’s instructions. The quantity and quality of DNA were checked by spectrophotometer (Jenway Genova Spectrophotometer Krackler Scientific Incorporation, USA). The O.D. ratios were between 1.7 and 1.9 indicating high quality DNA as indicated by Sambrook et al,11. The exon 3 of LEP gene was amplified from sheep DNA samples by using two PCR primers, LEP-up (CTCTTGATGTCCCCTTCCTC-3′) and LEP-dn (5′-TGGTCCTTCGAGATCCATTC-3′) according to Boucher et al,3. Polymerase Chain Reaction (PCR) amplifications were carried out in a 25-µl reaction volume containing 100 ng of template DNA and 2 µl of each 10 µM primer. To reduce the possibility of cross contamination and variation in the amplification reactions, master mixes containing all PCR reagents including the Kapa Taq polymerase enzyme (KAPA Biosystems, Boston, MA, USA) except DNA template and primers was used. The amplification program was performed using the Gene Amp PCR system 9700 thermocycle (Applied Biosystems, Warrington, UK). The amplification protocol was initial denaturation step for 2 min at 94°C, followed by 35 cycles at 94°C for 30s, to 60°C annealing temperature for 40s and 72°C for 1 min. The final step of the amplification protocol was the extension step at 72°C for 5 min. Electrophoreses of the PCR products was done using 1% agarose gel and bands were detected by UV lamp after ethidium bromide staining through gel documentation system (Amersham Biosciences, Uppsala, Sweden). PCR products of LEP gene were cleaned and sequenced by the Advanced Genetic Technologies Center ((http://www.uky.edu/Centers/AGTC/). The DNA sequences were edited and aligned using BioEdit software (Hall6; http://www.mbio.ncsu.edu/Bioedit/bioedit.html). The BLAST algorithm was used to search the NCBI GenBank database (http://www.ncbi.nlm.nih.gov/) for homologous sequences. The BioEdit software was also used to detect SNPs and indel mutations. Eighty-one individuals representing two indigenous Saudi sheep breeds; namely, Najdi and Naeimi, generated PCR amplicons ranged in size from 1041 to 1058 bp using LEP-up (P5) and LEP-dn (P6) primers (Fig. 1); this fragment covers the LEP exon 3 region. The fragment length is similar to that amplicon size reported in the Gene Bank accession no. HE605296 of Ovis aries LEP gene (1058 bp) that covers exon 2 and 3. Additionly, to developed a LEP genetic map (Fig. 2), the authors retrieved different LEP ovine accession numbers representing genomic and mRNA sequences from GenBank (e.g. HE605296, U84247, AY911719, and AF310264) and used BioEdit software to align these sequences and locate the primers along it. The used three primer-pairs (P1-P2, P3-P4, AND P5-P6) in developing the LEP gene map have been extensively used in detecting genetic polymorphisms in ovine LEP gene3,5. When the PCR fragments were sequenced, 47 PCR amplicons out of the 81 generated PCR fragments (22 Najdi and 25 Naeimi sheep) gave good and readable DNA sequences. The remaining 34 amplicons (19 Najdi and 15 Naeimi sheep) showed good sequencing results up to approximately 550 bp position and then the peaks started to be doubled and were not readable (Figure 3). Generally, the aligned DNA sequences of LEP exon 3 showed three non-synonymous single nucleotide polymorphisms (SNPs) and two indel mutations. The SNPs were found at positions 170, 286, and 332 of the exon 3 coding region, whereas the two indels in the UTR region. The SNPs resulted in different amino acid changes, Arg/Gln (CGG/CAG-transition mutation) at 57 codon, Val/Leu (GTG/TTG-transversion) at 96 codon, and Arg/Gln (CGG/CAG-transition mutation) at 111 codon. Limited information is available regarding exon 3 polymorphism in LEP ovine gene. Boucher et al,3 successfully amplified a 926 bp fragment included the genomic sequence from exon 3 and part of the 3′ UTR of the LEP gene in Dorset and Suffolk sheep breeds and obtained only one SNP in the 3′ UTR of the gene (C617G). Also, Zhou et al,15 identified four SNPs in exon 3 of the ovine LEP gene from Romney, Merino, Coopworth, Corriedale, Poll Dorset and Suffolk sheep breeds in New Zealand; three of those obtained SNPs were non-synonymous and resulted in amino acid change of codon positions 105, 120 and 144. Similar works have been also reported for variety of animal species. Xiaoling et al,14 identified two SNPs in Exon 3 of porcine LEP gene in four Chinese breeds; the SNPs showed nucleotide transition from T→C at 3469 bp and G→T at 3714 bp in Exon 3 of LEP gene. Dubey et al,4 identified one silent mutation (CCG/CCA) in Exon 3 at 72nd codon in bovine LEP gene of mithun (Bos frontalis). In the present study, the identified SNPs have not been previously reported in other exogenous ovine genomes, and therefore, it may be considered exclusive for the Najdi and Naeimi sheep. Analysis of DNA sequences of LEP exon 3 revealed five mutations that classified the 47 LEP sequences into five different genotypes (Table 1). Genotype 01 has two SNPs (A/G and A/G) and represented by only one Najdi sheep. Genotype 02 was represented by 12 sheep (7 Najdi and 5 Naeimi), having one SNP (T/G) and losing a 16-bp indel fragment. Genotype 03 (2 Najdi and 1 Naeimi) resembled genotype 02 in missing the 16-bp indel fragment but it had G instead of T in the 286 position. Genotype 04 had a 1-bp indel (A/-) and detected in only five Najdi sheep. The remaining 26 sequences (7 Najdi and 19 Naeimi) were included in genotype 05. These genotypes were considered homozygotes. On the other hand, it is assumed that animals with the un-readable sequences (34 sheep) were probably had two different LEP alleles (heterozygotes). This assumption is based on the data at position 452 (Figure 3) where two overlapped peaks were detected; these overlapped peaks were resembling the two alleles A and G. Moreover, these DNA sequences were not readable at the 16-indel position, suggesting that these sheep had two LEP alleles of that mutation, one allele having the indel while the other missing it. The most common genotype present across the homozygote Saudi sheep was genotype 05 with a frequency of 55%, followed by genotype 02 (26%). Genotypes 01, 03 and 04 had a frequency of less than 10% in the investigated sheep. Interestingly, genotypes 02, 03 and 05 were found in both sheep breeds, whereas genotypes 01 and 04 were specific to the Najdi sheep. The present study provided basic information to understand the genetic diversity of local sheep breeds in Saudi Arabia. Sequence analysis revealed three single nucleotide polymorphisms (SNPs) in exon 3 of the Najdi and Naeimi LEP gene. These SNPs have not been previously reported in other ovine genomes. Further works will be needed on larger samples from each sheep breed to investigate the relationship between LEP gene polymorphisms and the performance traits. The authors extended their appreciation to the Deanship of Scientific Research at King Saud University for funding this work through the research group project RGP-VPP-282. Table 1. Different LEP exon 3 genotypes recovered from Saudi sheep. Figure 1. 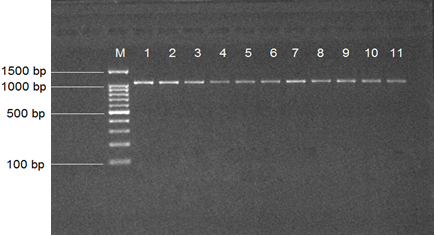 Stained 1% agarose gel showing the LEP exon 3 PCR amplicons generated from Najdi (lanes 1-6) and Naeimi (lanes 7-11) Saudi sheep. Lane: M, 100bp DNA ladder. Figure 1. Genetic map of ovine LEP gene showing primer positions, exons, and intron regions. The three LEP primer-pairs are used to detect polymorphisms in sheep populations worldwide. Figure 3. Chromatograms of LEP sequences showing: (panel A) the position of overlapped peaks representing two SNPs at 286 position and (panel B) unreadable sequences at the position of the 16-bp indel mutation. "Allelic Polymorphisms of Leptin Gene in Sheep." UKEssays.com. 11 2018. All Answers Ltd. 04 2019 <https://www.ukessays.com/essays/biology/allelic-polymorphisms-leptin-gene-3105.php?vref=1>. "Allelic Polymorphisms of Leptin Gene in Sheep." All Answers Ltd. ukessays.com, November 2018. Web. 26 April 2019. <https://www.ukessays.com/essays/biology/allelic-polymorphisms-leptin-gene-3105.php?vref=1>. UKEssays. November 2018. Allelic Polymorphisms of Leptin Gene in Sheep. [online]. Available from: https://www.ukessays.com/essays/biology/allelic-polymorphisms-leptin-gene-3105.php?vref=1 [Accessed 26 April 2019]. UKEssays. Allelic Polymorphisms of Leptin Gene in Sheep [Internet]. November 2018. [Accessed 26 April 2019]; Available from: https://www.ukessays.com/essays/biology/allelic-polymorphisms-leptin-gene-3105.php?vref=1.